vInspired, the charity dedicated to helping young people do good things, has teamed up with retail charity, Retail Trust, to offer young people in England aged 16 – 25 the opportunity to take part in a new 12 week skills development and volunteering programme called Retail Ready People (RRP). Retail Ready People will enlist young people who want to enter or progress in the retail sector and give them the chance to set up and run a high street shop in their local area. Working as part of a 30-strong team of young volunteers, they’ll take part in a free training programme to develop key retail skills. They’ll put their training into action by transforming empty shops into creative retail spaces at the heart of the community. The project will run in 10 high street locations across England between 2012 – 2014, with Brighton & Hove City and the London Borough of Enfield confirmed as the first two locations for 2012. Applications are now open! Retail Ready People is supported by vInspired, Retail Trust and Dan Thompson, of Empty Shops Network and #Riotcleanup fame, who will work with young people to turn empty shops into amazing pop-up spaces. Retail Ready People is an exciting FREE 12-week programme for 16 – 25 year olds, which gives you the chance to set up and run a high street shop in your local area. Currently running in Brighton or Enfield, Retail Ready People provides training and support as well as practical skills and experience to help you find a job or develop a career you’ll love! So, if you already work in a shop but want to progress or get promoted – or you’re just interested in finding out more about retail careers, then Retail Ready People is for you! Retail Ready People is a FREE 12-week skills development and volunteering programme which gives 16 – 25 year olds the chance to set up and run a high street shop in their local area. Retail Ready People provides training and support as well as practical skills and experience to help young people find out more about retail careers, progress and get promoted. Working as part of a 30-strong team, young volunteers will take over an empty shop for up to 1 month and transform it into a creative retail space at the heart of the community. They’ll manage all aspects of the shop, including customer experience, visual merchandising, stock control, branding, PR, marketing, finance, decorating shop-fitting and staffing. Where and when does the project take place? Retail Ready People will run in 10 high street locations across England during 2012 – 2014. Brighton & Hove City and the London Borough of Enfield are confirmed as the first two locations, running from 3 September – 12 December 2012. 11 / 12 December Wrap up and celebrate! How will our business benefit from Retail Ready People? Retail Ready People will give existing retail employees new skills, confidence and experience through free training, mentoring and support, helping to drive your profits, CSR and brand loyalty. The programme will also give unemployed young people the chance to become Retail Ready and make a positive difference to local communities where you operate. Get involved today and help us to support the next generation of Retail Ready People! To discuss the programme and the opportunities for your organisation please contact Laura Horsley at Retail Trust, lhorsley@retailtrust.org.uk or 020 8358 7223 / 07725 672 468. Retail Ready People is a FREE 12-week skills development and volunteering programme which gives 16 – 25 year olds the chance to set up and run a high street shop in their local area. 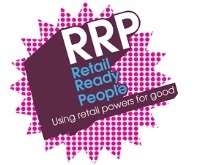 RRP provides training and support as well as practical skills and experience to help young people find out more about retail careers, progress and get promoted. Do you own or manage an empty shop or retail unit? We’re on the lookout for great empty shop spaces in Brighton & Hove City and the London Borough of Enfield. Supported by a generous pop-up shop budget, Retail Ready People volunteers will transform disused, empty shop units into creative retail hubs at the heart of the community. Donate your empty retail space! If you have an empty shop or vacant retail unit that’s available from 1 October – 12 December 2012, please get in touch at retailready@vinspired.com – we’d love to hear from you! Why should landlords support Retail Ready People? This entry was posted in Campaigns, Events, News, The Retail Champion and tagged retail ready people, retail trust, vinspired. Bookmark the permalink.